A study of the biblical “Divided Kingdom” period is challenging, (1 Kgs. 11ff. and 2 Chron. 11ff.) to say the least. The 1st of Israel’s kings, Jeroboam, made several (unauthorized) changes in the pattern for worship that Yahweh had revealed (see our previous post here). Jeroboam’s motive was to solidify his power, and to prevent his subjects from going south to Jerusalem to worship, which he thought would likely cause their loyalty to shift. 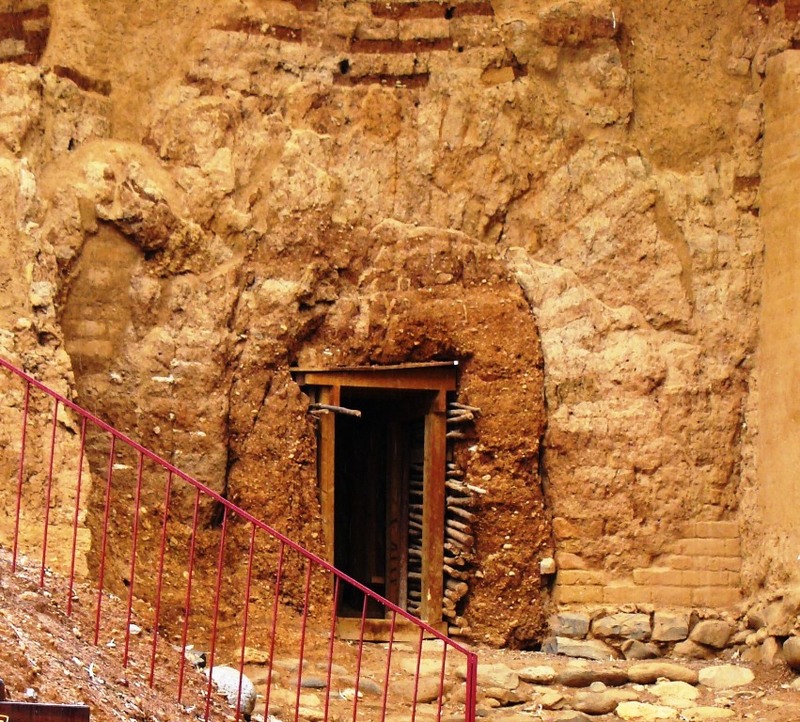 At Dan it is possible today to see the site referenced so many times in scripture, that of the high place where Jeroboam placed his golden calf. cf. 1 Kings 12:30: “Now this thing became a sin, for the people went to worship before the one [golden calf] at Dan.” “This event became sin to the house of Jeroboam, even to blot it out and destroy it from off the face of the earth” (13:34). Reference is made to the sins of Jeroboam “which he committed and with which he made Israel to sin” (14:16). Info Sign at High Place at Dan. Photo by Leon Mauldin. View of the altar where sacrifices were offered. Photo by Leon Mauldin. 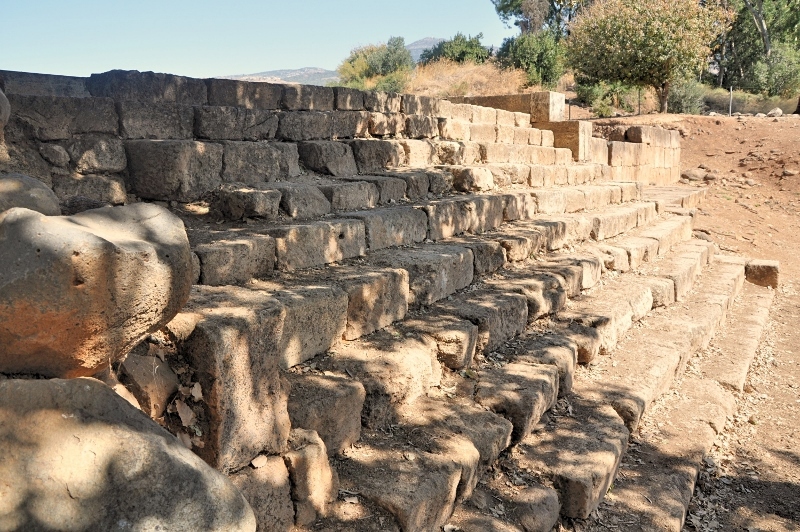 Steps leading up to the platform where the golden calf was enshrined. Photo by Leon Mauldin. According to the Bible, David ruled in the tenth century B.C.E., using the traditional chronology. Until 1993, however, the personal name David had never appeared in the archaeological record, let alone a reference to King David. That led some scholars to doubt his very existence. According to this speculation David was either a shadowy, perhaps mythical, ancestor or a literary creation of later Biblical authors and editors. 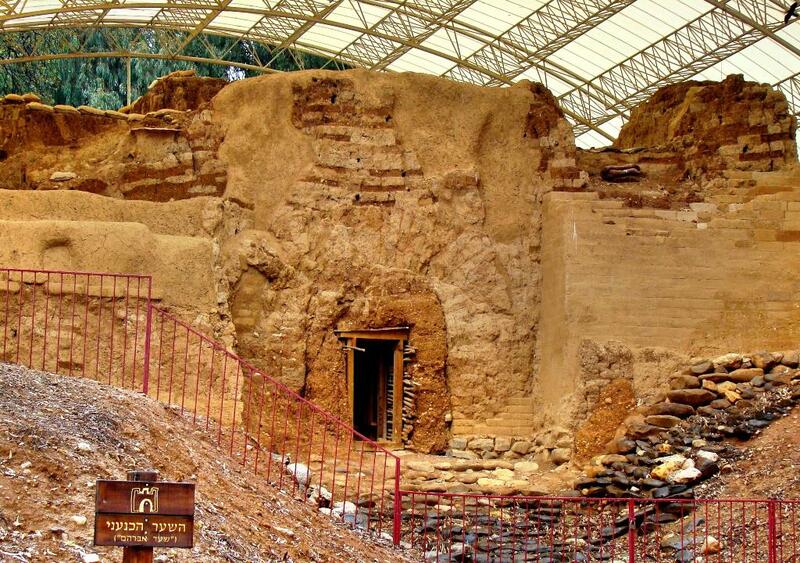 In 1993, however, the now-famous Tel Dan inscription was found in an excavation led by Avraham Biran. Actually, it was the team’s surveyor, Gila Cook, who noticed the inscription on a basalt stone in secondary use in the lower part of a wall. Written in ninth-century B.C.E. Aramaic, it was part of a victory stele commissioned by a non-Israelite king mentioning his victory over “the king of Israel” and the “House of David.” [See BAR 20:02, Mar-Apr 1994] Whether or not the foreign king’s claim to victory was true, it is clear that a century after he had died, David was still remembered as the founder of a dynasty. This past October I had the occasion to photograph this important stela, which is housed in the Israel Museum in Jerusalem. 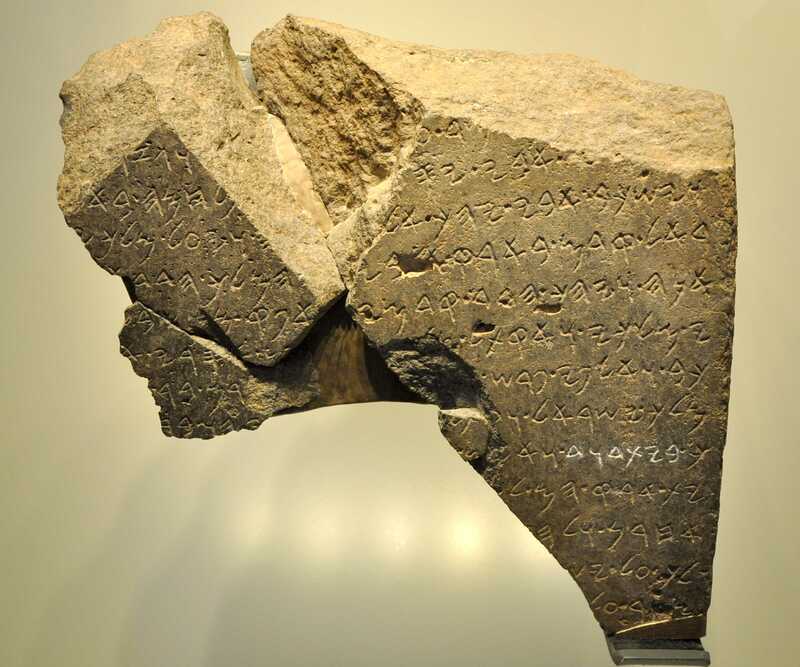 Gary Byers suggests that the stela “most likely memorializes the victory of Hazael, king of Aram, over Joram, king of Israel, and Ahaziah, king of Judah, at Ramoth Gilead recorded in 2 Kings 8:28–29” (Bible and Spade 16:4, p. 121). For more information on the House of David see Ferrell Jenkins’ post illustrating Isaiah 7 here. The wisest man in all the earth fell flat on his face because he failed to give heed to God’s word. The sad story of Solomon’s apostasy is narrated in 1 Kings 11:1-13. As punishment God would “tear the kingdom” away from Solomon, and give it to Jeroboam (v.11). This took place when Solomon’s son’s effort to make a show of strength backfired, and all the northern tribes pulled away under Jeroboam, and made him king (1 Kings 12:1-24), leaving Rehoboam as king of Judah. Object of worship. Jeroboam made two calves of gold and said, “It is too much for you to go up to Jerusalem. Here are your gods, O Israel, which brought you up from the land of Egypt! (1 Kings 12:28). Place of worship. God had established Jerusalem as the place to worship. 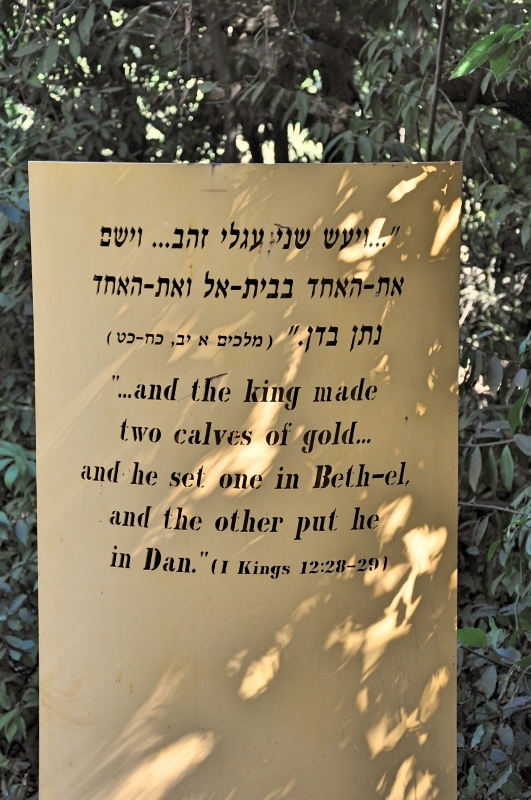 The king set up those golden calves in Dan (north) and Bethel (south) (v.29). 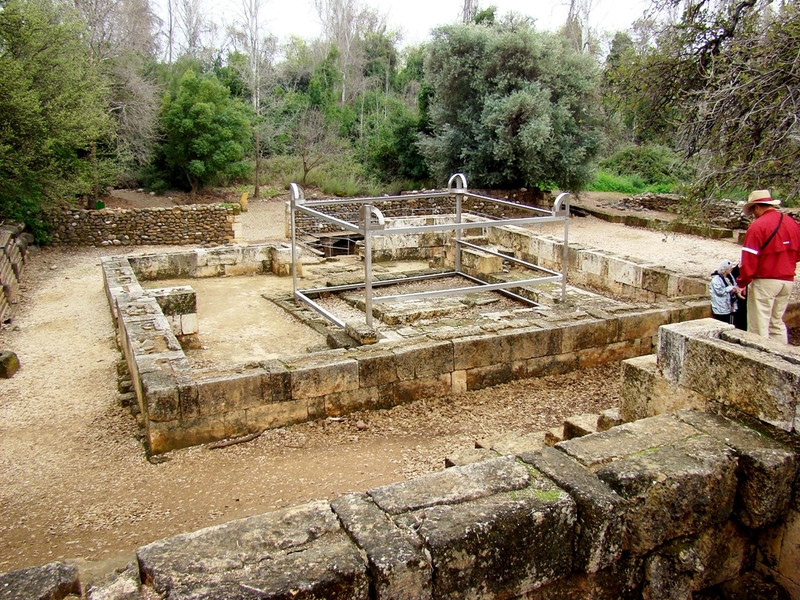 Shrines were established on the high places for their worship at both sites (v.31). Persons who officiated in worship. God had selected the tribe of Levi, and within it the family of Aaron, to be priests. Jeroboam “made priests from every class of people, who were not of the sons of Levi” (v.31). Time of worship. God had designated the Feast of Tabernacles to be observed the 15th day of the 7th month; Jeroboam changed it to 15th day of the 8th month (v.32). 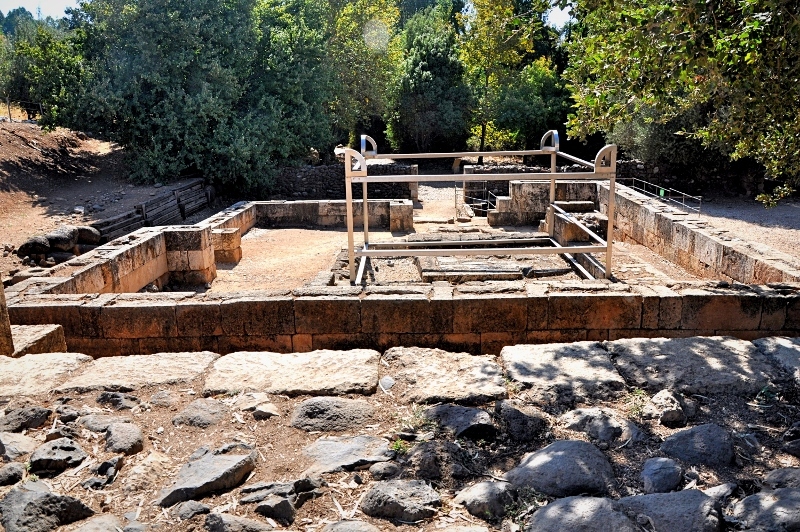 Our photo shows the high place at Dan where sacrifices were made to the golden calf Jeroboam installed. The people give a sense of scale. Jeroboam's High Place at Dan. Photo by Leon Mauldin. The square metal framework in center indicates the location and size of the altar. The shrine for the golden calf would have been in the area we are standing to shoot the photo.